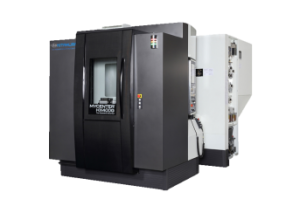 Kitamura’s Horizontal Machining Centers offer the benefits of extra-large work envelopes coupled with outstanding accuracies. Beefy and rigid with the ability to handle hard materials and heavy duty cuts, consider a Kitamura Horizontal an investment in performance and precision. 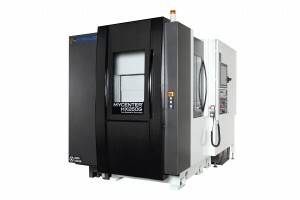 From solid Meehanite cast construction to patented twin ballscew and dual feedback technology offering 2,362 ipm rapid rates on solid boxways, to the sheer power of our geared head spindles, Kitamura Horizontals offer you long machine tool life along with the continuous accuracy and reliability necessary for you to get the job done. 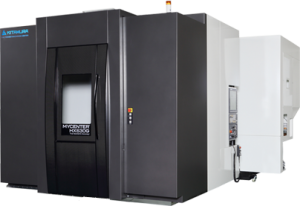 Insistence in utilizing reliable high end quality components and suppliers, integrating process control during production, assembling testing, and quality control will provide the end user with a reliable, accurate, and heavy duty Horizontal Machining Center. 30 Taper HMC that can cut steel! Roller Ways, Full 4th Axis, priced very competitively! • Powerful 15,000rpm, dual contact spindle – Now Available, 30,000rpm HSK-E40 spindle!